Dr. Joy DeGruy speaks in front of a packed house at the Frauenthal Center in downtown Muskegon. Photo by Joe Lane for the Community Foundation for Muskegon County. Before the doors even open, the sold-out crowd gathers at the Frauenthal Center. Shivering from November’s cold that has descended upon Muskegon, people are rushing downtown: from work, from the polls, from their lives throughout West Michigan. Most of their coats sporting “I voted” stickers from the day’s mid-term election, attendees are embracing one another in greeting and waiting to be the first ones seated for Dr. Joy DeGruy, an internationally renowned author, researcher and educator who has come to Muskegon to speak about a disease called racism and how we as a country heal from it. The doors open, and, quickly, people fill the seats inside the cavernous Frauenthal Center. Selfies are being taken. Photos are being posted on Instagram: “Ready to have this brilliantly intellectual woman speak volumes,” one person writes in his caption. In the moments leading up to DeGruy’s talk, titled “Understanding Our Past: Healing Our Future,” people are dropping phrases like “post traumatic slave syndrome,” “racism in Muskegon,” and “structural racism.” There’s certainly an excitement among attendees to see DeGruy speak, but it’s something more than that: there is, simultaneously, palpable sadness, relief and joy reverberating throughout the crowd. A scholar, known around the globe, is about to take the stage in Muskegon and speak hard truths about racism in the United States of America. About slavery and slave-owning presidents. About violence, trauma and segregation. She will talk about the myths that we as Americans can tell ourselves: about freedom, about equality, about history. 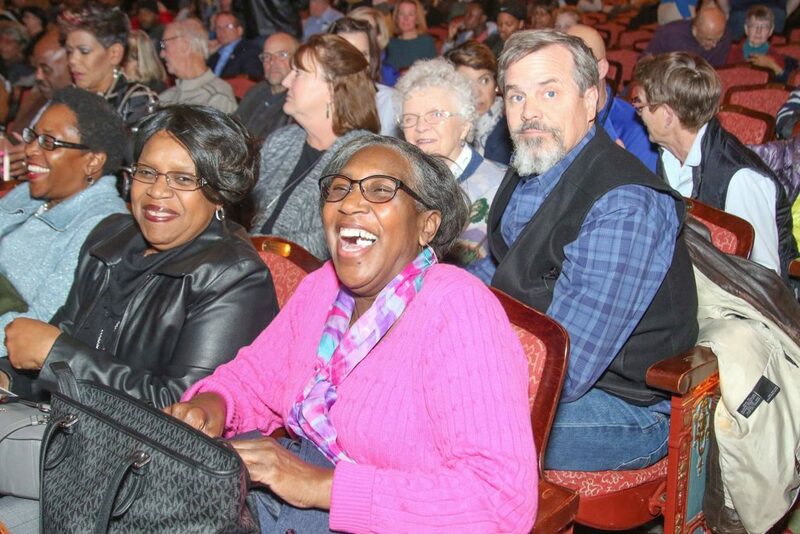 It will be a powerful and poignant whirlwind of a night that will leave audience members both in tears and laughing, a night that leaves people saying: what do we do to address racism in Muskegon County? How do we confront our history, be honest about—and change—our present, and work towards a truly equitable future? Audience members at Dr. Joy DeGruy’s talk. Photo by Joe Lane for the Community Foundation for Muskegon County. These are messages that deeply resonate with the audience—a packed crowd that includes an impressive spectrum of people, from nonprofit CEOs and factory workers to educators and artists—among so many others. 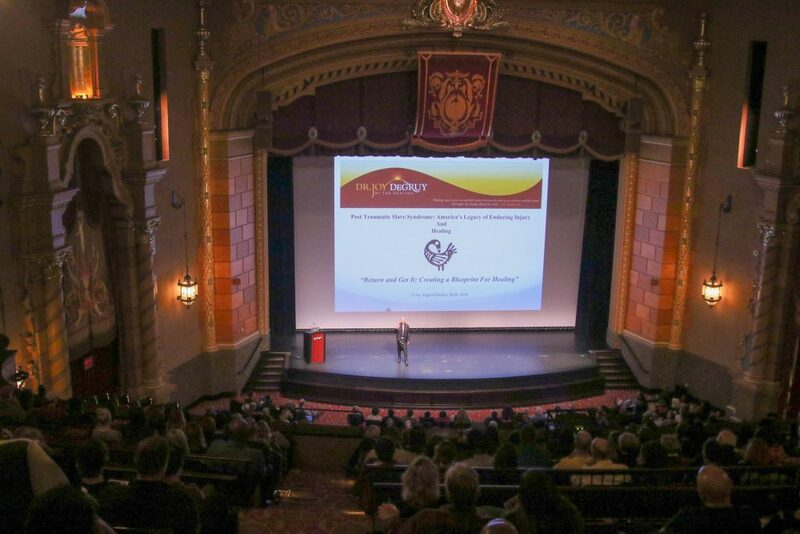 The Community Foundation for Muskegon County sponsored the DeGruy talk as part of its ongoing efforts to build a more inclusive community. The United States is a “divine experiment,” and, “if we can make this thing work, I really, truly believe the rest of the world has a chance,” DeGruy says in the first minutes of her talk. “We have an amazing diversity that clashes with each other, but it’s a diversity that created the brilliance of this country,” she continues. But, DeGruy says, to make this work—to truly have an equitable country of which everyone feels, and is, a part—there needs to be a lot truth telling. And that truth needs to include the history of slavery and the impact it continues to have on our society today, from the way we talk about race in our day-to-day lives to our historical narratives, education systems, scientific institutions, and more, DeGruy explains. This understanding of history—and how deeply entrenched we and our communities are in a most incomplete telling of it (including how we do, and do not, speak about the enslavement of Africans and the genocide of Native Americans)—is a crucial one to forging a future that is truly able to create a healed nation, DeGruy explains. That miseducation translates to, well, a lot—and much of it is rooted in the way we navigate race in our own lives. Dr. Joy DeGruy. Photo by Joe Lane for the Community Foundation for Muskegon County. 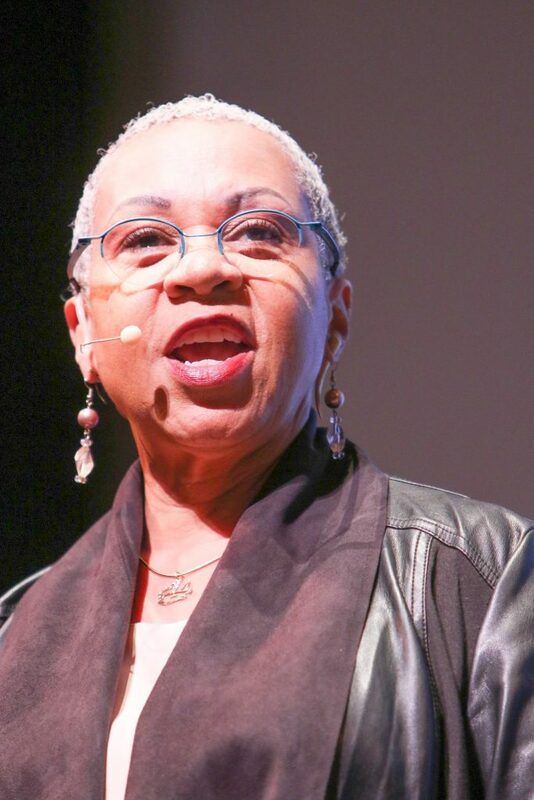 To “not” see race is an attempt to erase someone and their experiences, DeGruy says. It’s imperative to talk about race, whether that’s in our own individual interactions or when it comes to large, institutional matters. For example, in a Muskegon workshop led by DeGruy the day after her talk at the Frauenthal, attendees note we as a community must be able to ask hard questions about race, racism, and prejudice. Why are some organizations’ and companies’ boards filled entirely with white individuals? How do we make our downtown more inclusive? 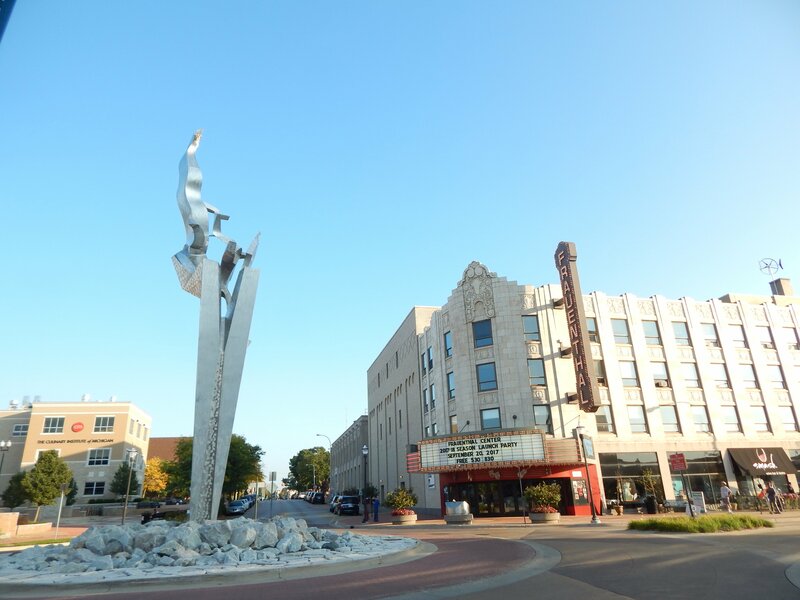 How can we make the growth Muskegon’s experiencing translate to a more equitable community? How do we address racism in hiring and in the workplace? How do we make everything from education and the arts to transportation and healthcare more accessible to people and communities of color? Here’s the thing, DeGruy notes: conversations about race are hard. Conversations about slavery are hard. But if we want to really, truly address race and racism in this community and country, those conversations not only need to be had: they have to impact action. Attendees at DeGruy’s workshop emphasize this, noting that white individuals and people in positions of power are going to have to say: racism is not happening outside of my world; it’s not just happening in another place, to other people. It’s happening here, and I am able to speak up about it. I am able to change the way I myself operate. I am able to call out racism when I see it. Not only am I able to do this, I must do this. In other words: individuals are going to have to understand white privilege, how they benefit from it and how they can use it to make whatever space they’re in more equitable. DeGruy explains this during her workshop with a personal anecdote about a trip she and her sister, who’s half-black, half-white but looks white, took to the grocery store. During this trip, DeGruy’s sister has no problem paying with a check. But, when DeGruy goes to pay with a check, she’s asked for two forms of identification—and the employee begins comparing DeGruy’s check to “bad” checks placed in a store binder. As this is happening, DeGruy’s sister confronts the cashier about why she’s doing this to someone who’s black and didn’t do it to someone who looks white. The sister proceeded to explain the situation to a store manager, and both the cashier and the manager ended up apologizing to DeGruy. You can see DeGruy speaking about this incident in the below clip. What needs to change when it comes to our discussions about slavery? The answer to this question is a long and complicated one. What do we change? Well, a lot. Beginning with our narrative about our country’s origins, DeGruy notes. Who were the founding fathers when it comes to slavery? They were slave owners. What about Native Americans? Why is there rarely, if ever, mention, let alone in-depth conversation and study, of our country’s genocide against Native Americans? What happens, then, when we do not tell the truth? What happens when we do not speak about the fact that there were 13 U.S. presidents who were slave owners? When we do not speak fully about the 339 years during which 12.5 million Africans were kidnapped from their homes and forcibly shipped to North America, South America, and the Caribbean? When we do not talk about the role that science, religion, universities, the media, and other major institutions played in slavery? Those omissions and lies build up: they steal the country’s history; they steal the history of black Americans. And they pave the way for a present and future filled with misunderstandings and outright lies about slavery and its impact on today’s society. What does it mean to tell the truth? It means we have to disassemble the way we interact with our history—and that can be a very hard, very messy and very emotional endeavor. It means we have to say: the Constitution was not created for everyone. However, the desire to create a narrative that, as W.E.B. 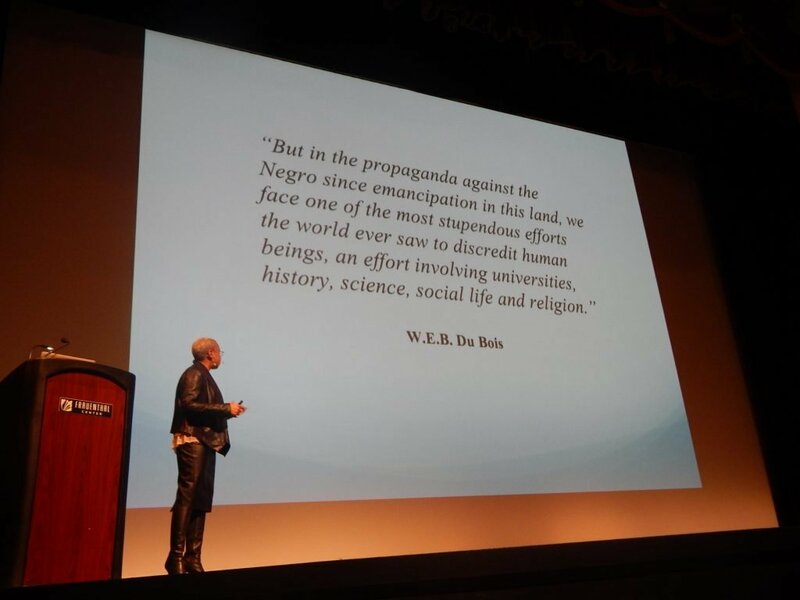 Du Bois says, erases the evils of history, is so powerful that “every major institution is complicit with 300 years of chattel slavery,” DeGruy says. By turning our backs on history, DeGruy explains, we perpetuate dangerous myths about who we are as a country. And we do not allow for a widespread understanding of the history of slavery, nor its ramifications after slavery ended, including Jim Crow, the lynchings of black Americans, the “war on drugs” that disproportionately targeted black individuals and people of color, mass incarceration of black Americans and people of color, and wildly unequal education, employment and housing systems. So, what needs to be done to address this? DeGruy points out that in 2016, the United Nations called on the U.S. to establish a national commission to “monitor the human rights of African Americans” and begin taking steps to repay the labor performed by slaves, from American independence through the Civil War—an amount that has been valued at about $5.9 trillion. “The rest of the world is looking on and saying, ‘shame on you America; shame on you,'” DeGruy says. “Most of us think to ourselves: wait a minute, children being torn apart from family? Does that sound familiar?” she asks, referring to the more than 2,600 children separated from their families when crossing into the United States at the Mexican border. All of this, DeGruy knows, can be overwhelming, especially as the majority of Americans this year said racial tensions are on the rise. But, she emphasizes that doesn’t mean that, hundreds of years after the first slaves were forced into the United States, we can’t finally have the conversations regarding slavery and race that we’ve been avoiding for far too long. What does staying in the room mean here in Muskegon? For those attending DeGruy’s workshop, they say it’s a multi-pronged answer that includes: understanding and recognizing both historical and current segregation, racism and bias in Muskegon County, from redlining to recent acts of hate. Facing that Muskegon is one of the most racially segregated cities in the country—understanding how that has come to be and what we must do to change that. Questioning racism, bias, power structures, and prejudice—including with one’s own self. Talking to kids about race, racism, privilege, and prejudice. Using white privilege to stand up for others. Knowing that change does not come easily, and sometimes you are going to have to make others uncomfortable or angry in order to truly achieve justice. That justice comes in many forms, those attending the workshop note—it means talking about housing and race in the city, about who does and does not feel welcome downtown and why, about supporting and growing businesses owned by people of color. It means acknowledging and fighting racism in the city. “Residents who have owned homes for decades do not feel involved in decisions about the city,” Community enCompass Executive Director Sarah Rinsema-Sybenga says during DeGruy’s workshop. Audience members watch Dr. Joy DeGruy speak at the Frauenthal Center. Photo by Joe Lane for the Community Foundation for Muskegon County. Facing race in Muskegon means understanding, acknowledging and working to change the role of racism, bias and prejudice in hiring and addressing income inequality, like the fact that, in one Census tract in Muskegon Heights, the average income is $17,083—while in the Census tract immediately to the south, in Norton Shores, the average income is $67,057. A number of people who spoke to the Muskegon Times during the workshop, but did not want to be quoted for fear of reprisal, said people of color routinely face racism and prejudice during hiring practices in Muskegon. If people of color do end up being hired, they can face racism and prejudice within the workplace. However, people told us individuals do not want to speak out about these matters for fear of being fired and/or never being hired in the community again. DeGruy suggested that community leaders create what’s known as a “Green Book” for Muskegon—a document reminiscent of the “Green Book” that was published in the 1930s through the 1960s and detailed places that were black-owned or safe for black Americans. [You can read digitized copies of the Green Book here.] The same, DeGruy says, could be done in Muskegon: what organizations, businesses and other spaces are run by people of color or are allies with people of color? For those who are interested in getting involved in conversations surrounding race in our community, there are a number of upcoming events. See further details about these events by clicking on this link from the Community Foundation for Muskegon County. What: Learn more about the criminal justice system and what is happening in Muskegon County. The event is free, but please RSVP by clicking here. What: Narrated by Cicely Tyson, this film explores the struggles of African-Americans as they migrated from the southern United States to Muskegon during the 1940s. See more information about the film here. Admission to the film is free. 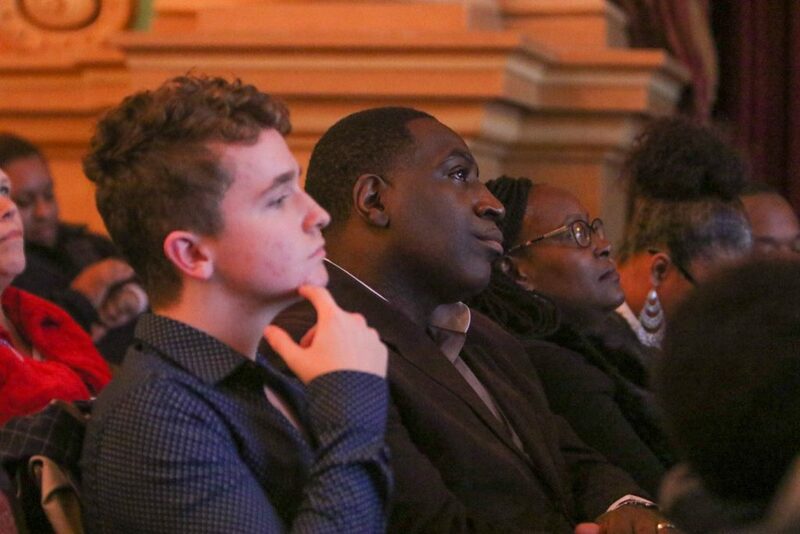 What: This feature-length film is part of the Muskegon Museum of Art’s exhibition “SONS” and features 32 African-American men from across the greater Muskegon community. This screening is free and open to the public; no tickets are required. When: Thursday, Dec. 13 through Sunday, March 10. The exhibition’s opening reception will be held Thursday, Dec. 13 from 5:30-7:30pm at the Muskegon Museum of Art. A free community day will be held from 10am-3pm on Saturday, Dec. 15, when all are invited to explore the new exhibition and attend free related programming at the art museum. What: An artist, designer, art director, and writer who was one of the earliest African Americans to work professionally in New York City’s advertising business, the work of Joseph Grey II helped to break down racial barriers in one of the most influential cities in the world. A gallery talk with Joseph Grey II will be held Thursday, Feb. 24 at 6pm at the Muskegon Museum of Art. The talk is free and open to the public. Where: Location to be determined. 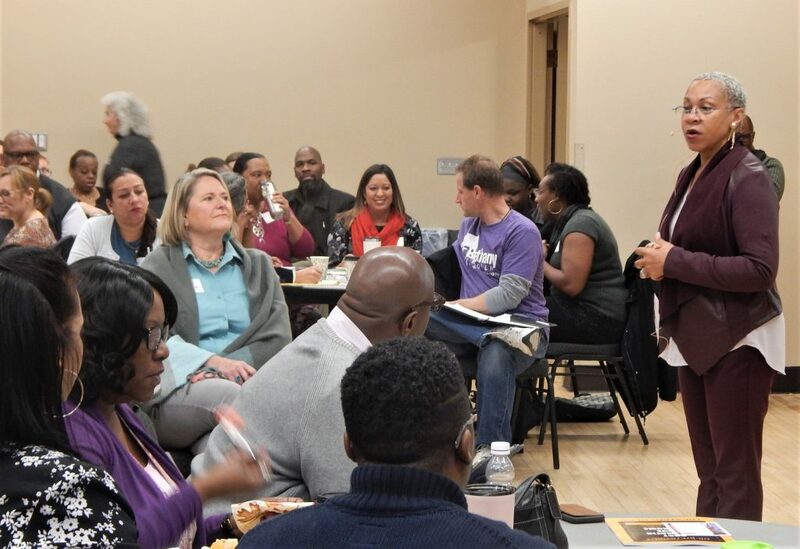 What: Hosted by HealthWest and funded by a Community Foundation for Muskegon County grant, this event is part of a series of community conversations meant to prompt discussion about race, equity, inclusion, and diversity. The event is free and open to the public, but you need to register in advance. To register, please click here. What: Each year, Muskegon Community College hosts a county-wide breakfast to honor the memory of Dr. Martin Luther King Jr. This year’s keynote speaker will be Anne Bailey, author of “The Weeping Time: Memory and the Largest Slave Auction in American History.” Tickets for the breakfast are $25 each and are available at the MCC bookstore beginning Dec. 3. Call 231-777-0569 for more details about the event. Story by Anna Gustafson, the publisher and editor of Muskegon Times. Photos by Joe Lane and Anna Gustafson. Connect with Anna by emailing MuskegonTimes@gmail.com or on Facebook, Twitter and Instagram.